IC Insights recently released its October Update to The McClean Report, which examined the effects of slowing worldwide GDP growth and a stronger U.S. dollar on the 2015 IC market forecast. Since all of IC Insights’ figures are presented in U.S. dollars, a strengthening U.S. currency deflates foreign sales and market results while a weakening U.S. dollar serves to inflate the sales and market figures. The rare occurrence of significant strengthening of the U.S. dollar versus most of the major currencies this year is expected to deflate the 2015 worldwide IC market growth rate by at least three full percentage points. This “deflation” presents itself in the form of lower IC average selling prices (ASPs), which are forecast to register a steep 5% decline this year when reported in U.S. dollars. 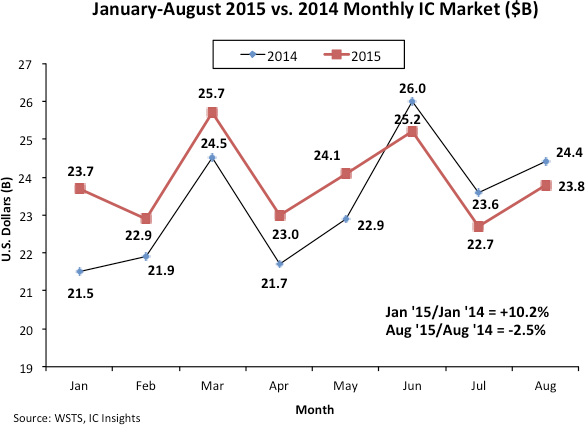 Figure 1 compares the worldwide monthly IC market figures from January through August of 2015 and 2014. As shown, the beginning of this year started out very strong with the January 2015/2014 IC market showing year-over-year growth of more than 10%. In total, the 1Q15 IC market ended up 6.5% higher than the 1Q14 worldwide IC market. The second quarter of 2015 began by registering similar monthly year-over-year IC market growth that was displayed in 1Q15, with the combined 2015 April and May IC markets up 5.6% compared to the combined April and May IC markets in 2014. However, things began to change in June as the IC market ended up 3.1% lower than the June 2014 IC market. Unfortunately, as shown in Figure 1, the 2015 July and August worldwide IC markets followed the disappointing year-over-year trend that began in June. It should be noted that the average second half versus first half of the year growth rate in the IC market since 1990 is 9.2%. However, IC Insights is forecasting that the 2H15 IC market will be down 1.0% as compared to 1H15. If this occurs, it would be only the fifth time since 1990 that the second half of the year IC market was worse than the first half (the other years being 1996, 2001, 2008, and 2011). This weak second half market has resulted in IC Insights lowering its full-year 2015 IC market forecast from +1% to -1%. The current excess IC inventory is forecast to be under control by early next year. Worldwide GDP growth in 2016 is expected to show some improvement as compared to 2015. The U.S. dollar is unlikely to show nearly as much strength against the major foreign currencies next year as it did this year.